Multi-station press is an advanced press equipment, is the integration of multiple presses, generally by the head unit, feeding mechanism, press and tail part of the composition. The fastest beat up to 40 times / min or more, to meet the high-speed automated production. Screw press with screw, nut as a transmission mechanism, and by spiral transmission will flywheel forward and reverse rotation into the slider up and down reciprocating forging machinery. Work, the motor to accelerate the rotation of the flywheel to save energy, at the same time by screw, nut push the slider down. When the slider touches the workpiece, the flywheel is forced to decelerate to a complete stop, the stored rotational kinetic energy is converted into an impact energy, and the workpiece is deformed by the slider against the workpiece. After the blow, the motor reverses the flywheel and drives the slider to rise back to its original position. Screw press specifications with nominal work force to represent. 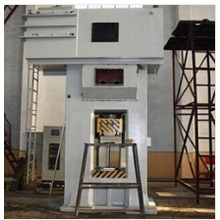 Crank press is one of the most popular cold stamping equipment used as a working platform for cold stamping dies. Its structure is simple, easy to use. 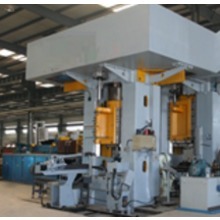 According to different forms of bed structure, crank press can be divided into open crank press or closed crank press; press the number of drive connecting rod can be divided into single-point press or multi-point press; press the number of slide Is one or two can be divided into single-action presses or double-action presses. 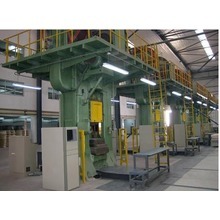 Multi-station press is an advanced press equipment, is the integration of multiple presses, generally by the head unit, feeding mechanism, press and tail part of the composition. The fastest beat up to 40 times / min or more, to meet the high-speed automated production. Threaded unit can be divided into unstacking unit, magnetic belt and cleaning, oiled equipment; feeding mechanism generally consists of feeding arms; press generally divided into multi-slider and single slider, according to different needs of choice, the tail part Generally formed by the conveyor belt. 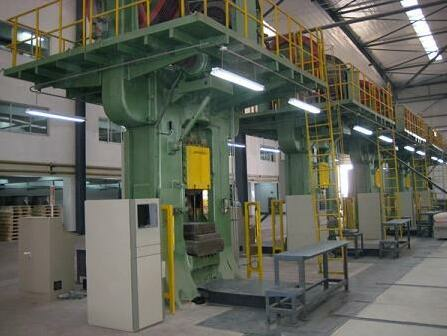 Double Disk Friction Screw Press..